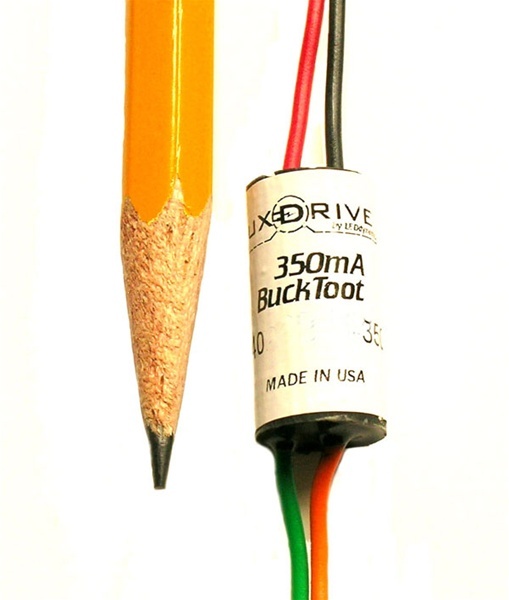 With an input voltage range of 5-28 VDC and a very small size, the BuckToot LED driver is a simple solution for powering 1 to 6 series connected LEDs at 350mA. The electrically isolated, encapsulated package is just 0.75" (19mm) long and 0.38" (9.7mm) in diameter, is resistant to harsh environments, and offers both open and short circuit protection. Due to the nature of a buck regulator, the input voltage to the driver must always be higher than the total forward voltage drop of all series connected LEDs. For example, if you have a series connected string of six LEDs where each LED has an average forward drop of 3.5V, the required minimum input voltage would be 23VDC. (3.5 x 6 + 2) A standard 24VDC power supply would be a good choice for this application.